Nice, hopefully its 2 cour again. @tsubasalover, how did you know that the anime is based on the manga series if the original source is the light novel? Pretty surprised that a sequel was announced so soon, especially since the first season was 2-cour. Anyway, great news. Charlotte is a dumpster fire. Shinsekai Yori has no characters. Oreimo's S2 specials don't actually exist. I live to see the day where Hidamari Sketch or Little Witch Academia get another season. Not really surprised tho. Many big events will happen in S2 so can't wait. Good to see that slimy boi is getting another season ! im not sure if its true, cuz i know some parts in anime are little bit different from manga and closer to novels. but i also heard that they agreed not to pass manga in first season. we need to find a reliable source . @Animechannel2213 @xFresh11 @vipergod Please check here (Posted by an Anime moderator). Wow, this is probably the fastest 2 cour LN adaptation sequel announcement I remember. A one year frame should be good to give time for the production. 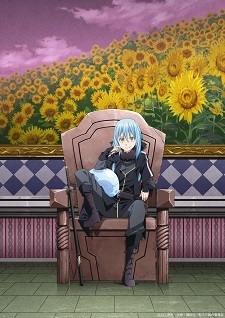 I hope they change the director, because I did not like their invented scenes of fanservice or how they treated the character of rimuru which was much more charismatic than this, I'm sure they did it so that it does not overshadow the other girls, it's equal to as they do in harem animes where the protagonist is always stoic and shy. Okay, get ready for more serious arc, it will be major tone shift from season 1 to season 2. Sweet! I have been enjoying this show a lot (plus it's been awhile since 8-bit made a season 2 to their stuff; I think the last sequel of any of their shows was Yama no Susume s3). I hope its another 25 episodes. As soon as it finishes, i'm binge watching this one, i've been waiting for that! It got a sequel pretty fast! I was already praying for a sequel even before half the show had aired. First Oregairu 3, now this... God, GOD, GOD THANK YOU!!!!!!!!!!!!!! Not surprising. Manga adaptation became top ten selling manga in japan. ***** **** Rimuru for the win! Cool, though hopefully it's as good as S1's first half and not as weak as its second half. I’m not the biggest fan of Season 1 but the first half was certainly entertaining and here’s to hoping so will the 2nd Season. It went downhill from the 15 episode so I hope next season will be better. Pass. Extremely disappointed with the second half of the season. It has been such a drag since the end of Ogre lord arc. The only isekai sequels I probably would gonna watch: Oda Nobunaga, Hataraku Maou-sama! and Grimgar but they will never get any sequels.